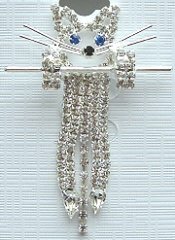 This rhinestone cat pin says "hang in there". The pin has a tie tack back so the tail dangles back and forth. The cat has blue eyes, a black nose and is 1 1/2" wide x 2" high.